Darragh MacAnthony os determined to bring Championship football back to Posh. 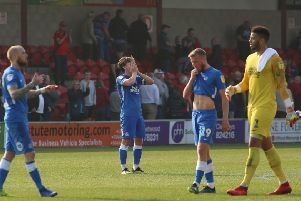 Chairman Darragh MacAntony admits he has had to make tough decisions in an attempt to deliver Championship football to Peterborough United. *He has transfer listed seven players and released three others because the last two seasons have been inconsistent and underwhelming and he can’t afford a third season like that. *The Football League Financial Fair Play rules make it necessary for the club to be more creative in terms of player recruitment and player contracts. *He transfer listed Newell after the player’s agent demanded a huge wage increase in order to sign a new contract at Posh. *He would rather striker Luke James spent a season out on loan than be sold, but the need for two forwards capable of scoring 40 goals between them in a season is vital. *The Posh players didn’t start last season fit enough. *That he would be interviewing other people for the Posh manager’s job despite spending two ‘brilliant’ days with current boss Dave Robertson. *The new manager will be announced before he leaves the UK at the end of May. Payne, Newell and James headlined the list of under-contract Posh players placed on the transfer list today (May 8). MacAnthony said: “I’ve had to take tough decisions because I want to get my club back to the Championship. All the decisions made about players staying or going has been based on that ambition. “A few people have questioned wny we are letting players like Jack, Joe and Luke go, but let’s face facts we have just finished ninth in League One and we have now experienced two very average seasons. I described last season as ‘underwhelming’ and I don’t want another season like that. The club has suffered for too long. “I want to bring exciting, entertaining players capable of scoring 100 goals in a season to our club, but my hands are tied somewhat by Financial Fair Play. That’s why I have to try and be creative and if letting a player go allows me to bring a couple in, then that’s what I will do. I have to be harsh if necessary. “Joe is entering the last year of his contract. He came through our youth team ranks and you never want to let a player like that go, but, while his agent intimated he would sign a new deal, the money he was talking about would have knocked us out of the ball park. Three Championship clubs are believed to be sniffing around Joe and if we can get a fee for him in the last year of his contract than that makes good business sense. “Luke is a great lad, but we need two strikers capable of scoring 40 goals between them next season. I’d rather he went out on loan next season, scored lots of goals and came back to us on fire, but he is available for transfer as things stand. “We are already talking to players we believe will do a great job for us next season. Some of the players we are after would shock you. We’ve spoken to a goalscorer who doesn’t currently play in the Football League. “We’re talking about taking a couple of Premier League players on loan as that’s an area we haven’t been good in. MK Dons have been promoted on the back of great use of contacts and great use of the loan market. “I’m not saying we will take five or six on loan, but I am saying we might take one or two. “It’s been a tough season for us. If you wrote a list about what could possibly go wrong before the season started, pretty much all of it did. We had strong players missing virtually the entire season and about 20 other serious injuries. “We planned to play with width which is why we signed Jon Taylor and Marcus Maddison. If they had both stayed fit for the whole season then we would probably have gained the extra points needed to at least reach the play-offs. “Marcus was incredible until he picked up his injury in October. England Under 21s were looking at him. “We have no big money player to sell at the moment. Doing that enables us to oil the wheels and do what we do best by investing in young talented players so I’m having to juggle. “I’m happy to provide the finances to get us back to the Championship, but it’s no longer a case of just throwing money into the club for players. I’m not allowed to do that through personal sponsorships any more. “If I can add four or five players to what we already have I’ll be happy. They will complement our talented younger players, all of whom will improve next season. “I’m excited about the future. Our pre-season programme is already pretty much in place. The players have their schedules for the close season and we will most definitely be fitter next season. “It was soon obvious last season that we weren’t fit. We couldn’t win a Tuesday game as we weren’t fit enough to play Saturday/Tuesday. That will change. “As for the manager situation, I have just spent two brilliant days going through a whole raft of things with Dave Robertson and Grant McCann. “I am still going to talk to other people, but a decision will be made while I am in the Uk this month. Rotherham are one of the Championship clubs known to have shown an interest in Newell. Posh are allowed to spend 60% of their turnover on player wages and transfer fees.